I hate to say it, but I think I might be a (rather unhappy but) slightly better person when JF is away. I watch less television, sleep more, eat better, and get more done. He’s only been back for four hours and I can already feel my brain descending into happy slothfulness. In any case, my greatest accomplishment – while JF was slurping on Bonanza Browns by the Klondike – was painting the attic. JF’s man attic, pre-paint. And covered in spackle because it was once a studio. Months ago, my aunt JoAnne (a.k.a. the Paint Fairy) offered to come by and help me finish the sucker. 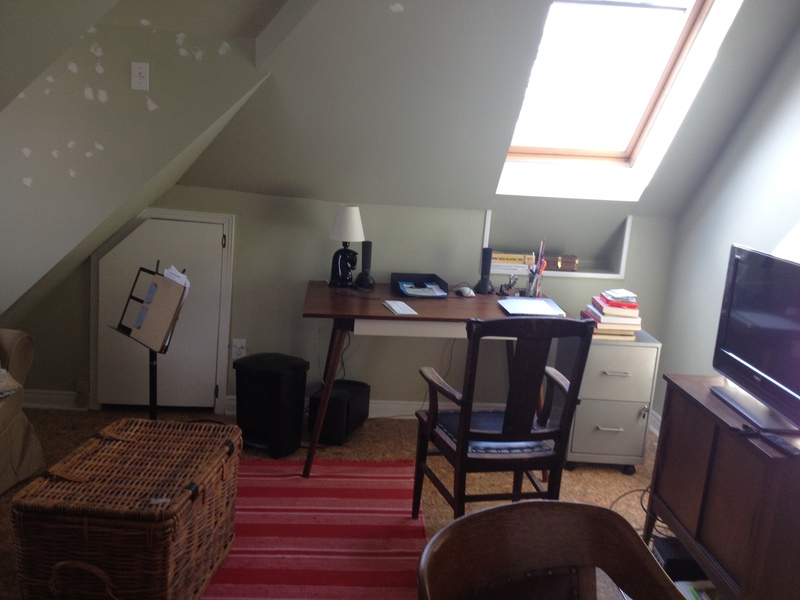 The rest of our home was painted last fall, but somehow the pocked-marked upstairs nook was intimidating. So many unusual angles and corners. The Paint Fairy’s kind proposal — and my aunt Denise’s paint donation — finally gave me the kicks in the arse I needed. The job took two coats and a whole day to complete. I couldn’t have asked for better company. We painted, paused for toasted tomato sandwiches, painted more, puttered in my garden, painted again, and then celebrated our success with wine and roasted potatoes. Merci, mes tantes pour vos beaux cadeaux. Our house feels more finished for them. This entry was posted in Decorating, House, Renovations and tagged attic, aunt, family, generous, gift, Home, house, paint, paint fairy, Renovation, spackle, studio by Mikaela Lefaive. Bookmark the permalink.